The ECAC is traditionally the third best conference, behind both the Big Ten and the MPSF. However, teams like Army, Navy and William & Mary have been challenging for spots at the NCAA championships and have been making moves up the rankings over the past few seasons. This year, Navy returns an experienced squad that should threaten a few higher-ranked teams this season, and William & Mary will have its sights set on upsets as well after being the first team to miss qualifying for the last year’s NCAA championships. Army will look to regain some of the momentum it lost over the past few seasons while Springfield will rely on a couple international elites to try to take the Pride to the next level. UIC will spend its season not only fighting for wins but also for the future of its program after its athletic department announced it will be cutting the men’s and women’s programs at the conclusion of the season. After qualifying for the NCAA championships in 2015, Army has slowly slid down the rankings. 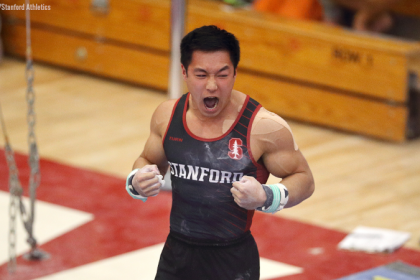 Stopping that slide won’t be easy with the loss of 11 routines from its postseason lineups last season, including Nathan Goff’s high bar routine that qualified him to the final at the NCAA championships. However, the Black Knights are returning five NCAA qualifiers, including senior Cole Casanova who qualified for the all around finals. Junior Alejandro Suarez will also bring in big scores for Army on vault and high bar, scoring over 14.000 on the former multiple times last season. If Army can get several routines out of its freshman class, it could open up the opportunity to improve on last season’s results. Navy has been on a steady rise over the past few seasons, ending last year with an 11th place finish at the NCAA championships after finishing ranked 17th in 2012. This season can be even better for the Midshipmen as they’re bringing in a big freshman class to replace only a couple routines lost from last season. 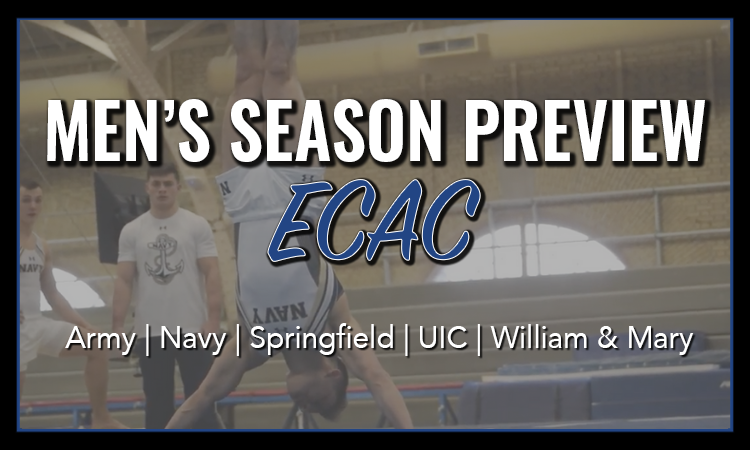 Navy is also returning several gymnasts who won ECAC titles last season, including pommel horse co-champion, sophomore David Toussaint, vault champion, junior Lucas Beltran and high bar champion, junior Ben Provost. Beltran, Toussaint and junior Frank Bradley were also NCAA finals qualifiers in 2018. 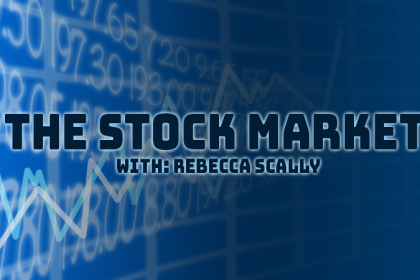 The Midshipmen have all the routines necessary to make major moves up the rankings if they can continue to improve like they have over the past few seasons. They could possibly even jump over a couple lower-ranked teams from traditionally stronger conferences like California and Iowa. Springfield has been steady with its placement in both the ECAC conference and NCAA rankings over the past several seasons. The graduation of all arounders Chris Graff and Joshua Dieker are big losses for Springfield, but thankfully they still have ECAC all around champion and NCAA qualifier Stephen Lewis on their roster. 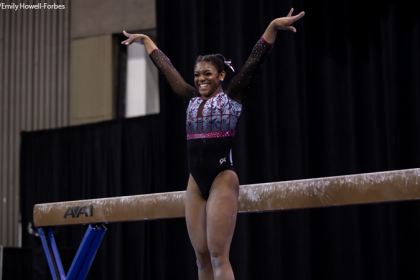 Lewis is an elite gymnast who has competed at several high profile meets including world championships for Jamaica, and has been named to their nominative roster for this year’s world championships as well. Senior Jannik Haas is also a returning NCAA qualifier, and watch for senior Joe Medina, a Puerto Rican elite, to be a standout for the Pride. UIC will look to have an incredible year after the recent announcement that the men’s and women’s gymnastics programs will be cut at the conclusion of the season. 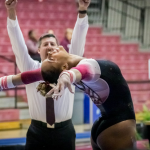 The Flames are losing only one gymnast from last year’s team, so they should be able to build upon their results from last season quite easily. Junior Asad Jooma, who competes internationally for Pakistan, was an NCAA finals qualifier last year on vault and will look to lead UIC to new heights this season coming off of a successful performance at the Asian Games this summer. Junior Satchel Hudson, an alternate for the NCAA championships last year, will be an all around stalwart in 2019 alongside Jooma. Check out “The Fight for UIC Gymnastics, and How You Can Help” to learn more about how you can help save the UIC gymnastics programs. The Tribe will look to regain the ECAC conference title this season after finishing first in 2017 and being beat by Navy last season. They will return two ECAC individual champions who will make an impact this year in floor champion, sophomore Cutter Fugett and pommel horse co-champion, senior Jacopo Gliozzi. William & Mary is also returning eight of its record-breaking 11 NCAA qualifiers from 2018. After finishing no higher than 12th but no lower than 14th over the past seven seasons and just missing qualifying as a team to the NCAA championships last season, this experienced Tribe squad has the capability to start breaking into the higher ranks for seasons to come.